Started the day by putting in an application for tickets for the Rugby World Cup in England & Wales next year. Have seen occasional signs of Argentine rugby during my stay – a pitch here, a newspaper report there. Made a bright and early tourist start across the sleepy Sunday morning city in the direction of the gallery of 20th Century Latin-American art, Malba. 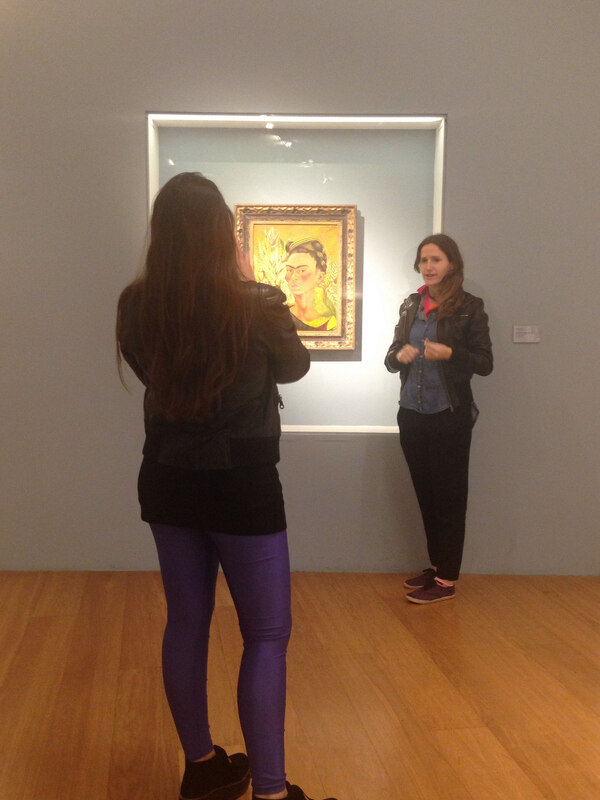 The BA at the end stands for Buenos Aires (Museo de Arte Latinoamericano de Buenos Aires). It was a 45 minute walk, back to the area where TV Publica lives. As I went past the law courts, motorcyclists of all shapes and sizes were gathering. About an hour later I saw them parading down Avenue Presidente Figueroa Alcorta making as much noise as possible, even the little Vespa at the back. I checked out the embassy quarter as the gallery didn’t open til noon, too enthusiastic for my own good, need to get myself on Latino time. The embassy area could easily have been in Paris, tranquil streets with 19th Century European style residencies. Some lovely trees, some interesting architecture (including a modernist building with metal oval door and oval windows), no-one around in the light drizzle. 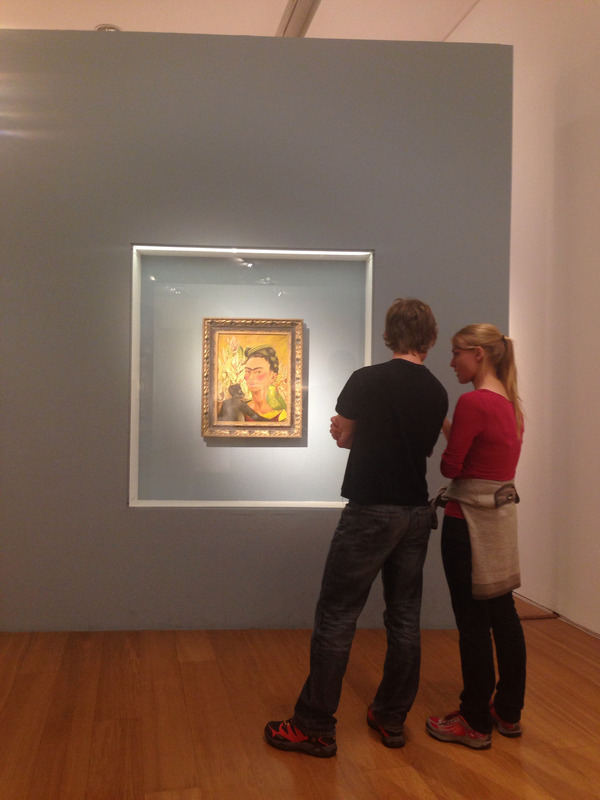 Once I got into Malba I made a bee-line for the permanent collection of 20th Century art, the collecting of Argentine businessman Eduardo Constantini, offered to the city as a permanent and public home for his significant collection. The city’s artist community backed him to the hilt, persuading the municipal authorities to grant him land on which to construct a purpose-built home for the artworks. 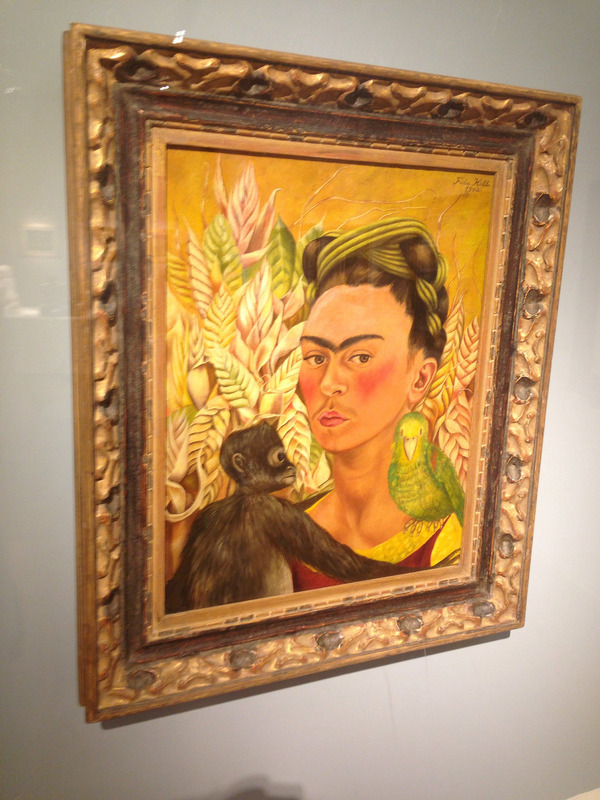 My visit centred on the stand-out exhibit, Frida Kahlo’s Autorretrato con Chango y Loro (Self-portrait with Monkey and Parrot) (1942) of which more here. Worth the price of admission and the 6,900 mile trip alone. Other highlights included Antonio Berni’s Manifestacion (1934), a great example of politically committed painting from Argentina and The Dressmaker (1935) by Amelia Pelaez of Cuba, really original drawing. I walked back to Plaza San Martin a different way, enjoying the Sunday afternoon calm. The streets were mainly populated by young people and young couples. After a bit of writing and feet resting in the comfortable, old-school hotel room, I taxied across to Palermo Soho, a bar and shop district on the other side of town, for the day’s meal. 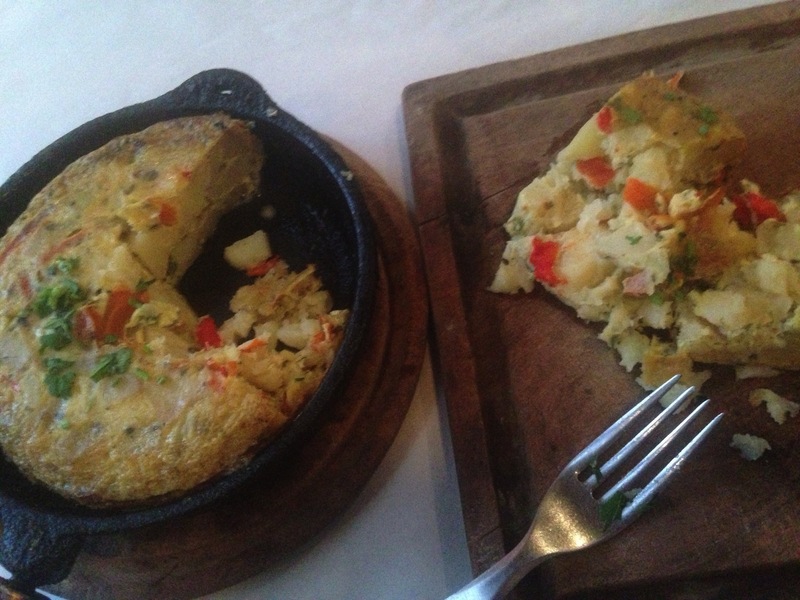 Highlight of that: tortilla. I wonder whether this Soho is named after New York’s SoHo, London’s or neither? A coffee and read to round off, then back to base ready for an early start on the journey to Uruguay. It’s not every day you get to visit a country beginning with U. Right up there with the day we walked across the bridge from Zimbabwe to Zambia, a double Z bonanza. I’ve never written a Picture of the Month in situ before but it’s a rainy Spring afternoon in Buenos Aires and I feel so inspired by this painting in the Malba gallery that I feel compelled to get a bit of energy out of the system. I’m dedicating this one to Una who would love this painting. 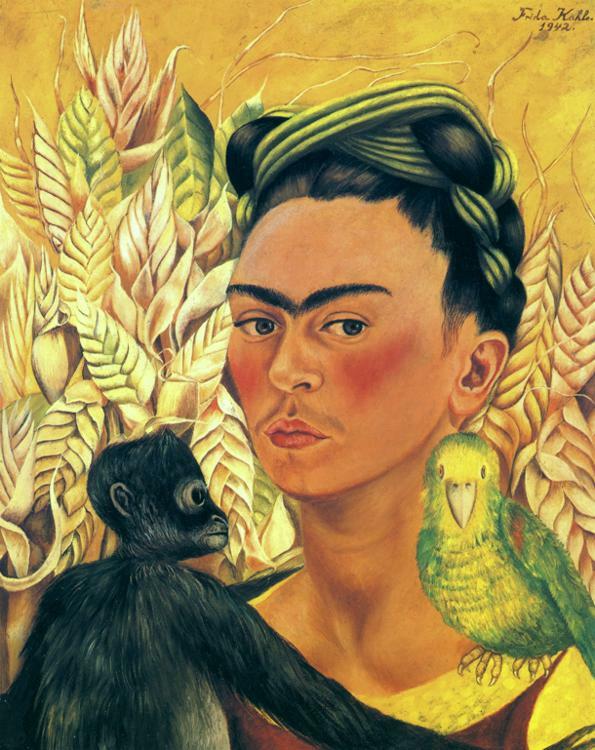 What’s unusual is that in many ways it’s a very simple painting, not much to work with – the artist, a monkey, a parrot and a background of wheat. Usually I pick images with more complexity to focus on in Picture of the Month. I’m about 20 inches away from it now, phone in hand to jot this on. 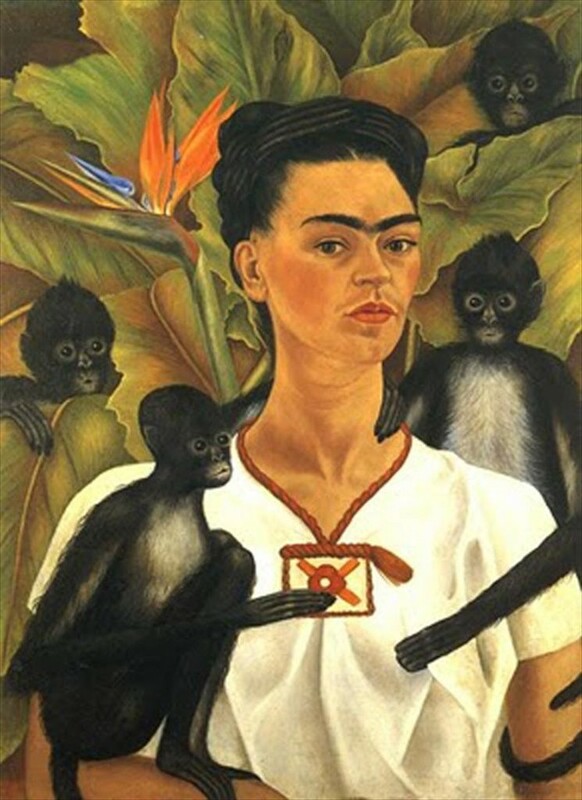 The eyes (woman, monkey, bird) make an equilateral triangle which is the heart of the composition. 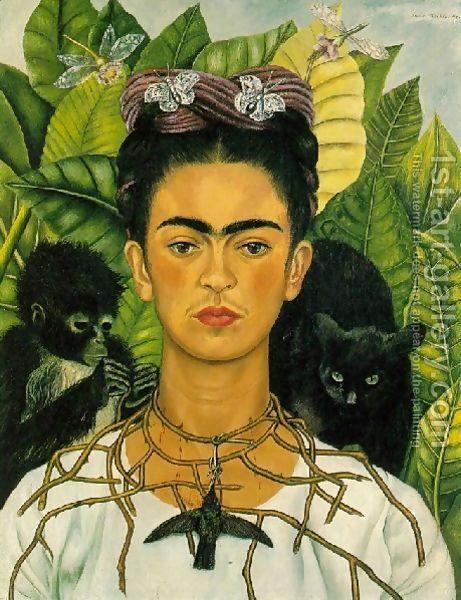 Frida’s look slightly left like she doesn’t give a monkey’s about the viewer. Her lips are tight. Her cheeks red. There’s a bit of anger or disdain or probably defiance there. The parrot looks straight out with both of its side-mounted eyes looking directly at the viewer – the only one of the three doing so. I saw a green parrot like this yesterday up in the trees at the bird sanctuary across town by the port, the Costanera Sur ecological reserve at Puerto Madero. Incongruously some distant relatives, also bright green, hang out occasionally in the allotments beside my house. 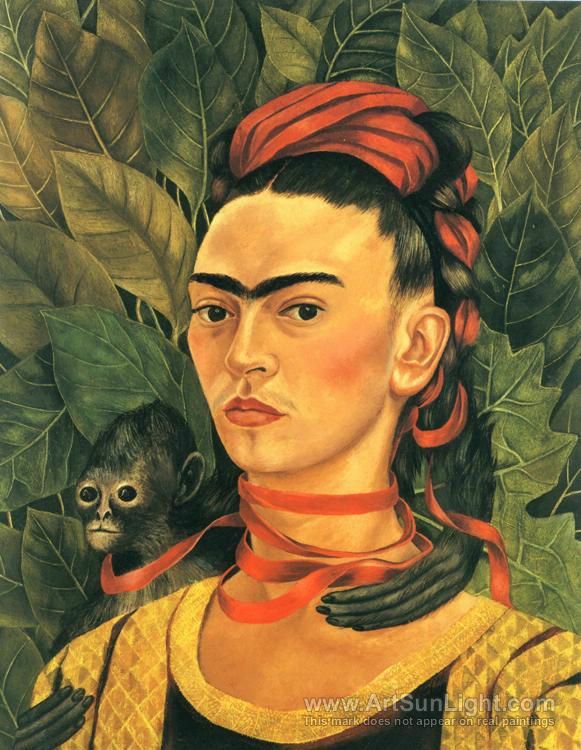 The monkey is looking out of the frame to the artist’s left – only one black eye visible like a Jack of spades. 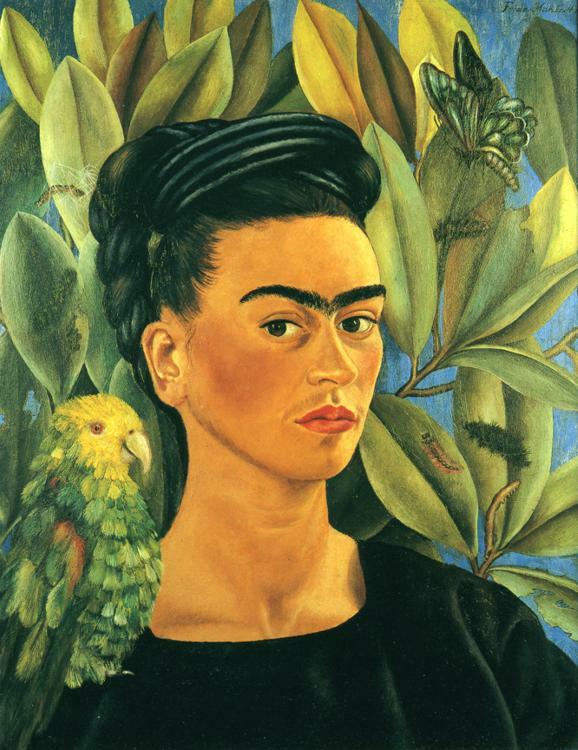 Frida’s hairband is green and yellow like the parrot. Her hair is black like the monkey. She is integrated with them. Are they two aspects of her? Talking and thinking or feeling? Her parents? Her children? Two people she knows? Two aspects of Mexico? No clues really – maybe they are just two animals or familiars. The parrot sits on her shoulder. Not much sense of its weight. The yellow and maroon dress she is wearing is flat and unruffled, making the parrot not quite of this world. The monkey is embracing her, an arm behind her back and one on her shoulder. They look close whoever he/she is. It’s got a little quiff. Its face is at once baby-like and old, more the latter. His (why do I keep thinking it’s a male?) 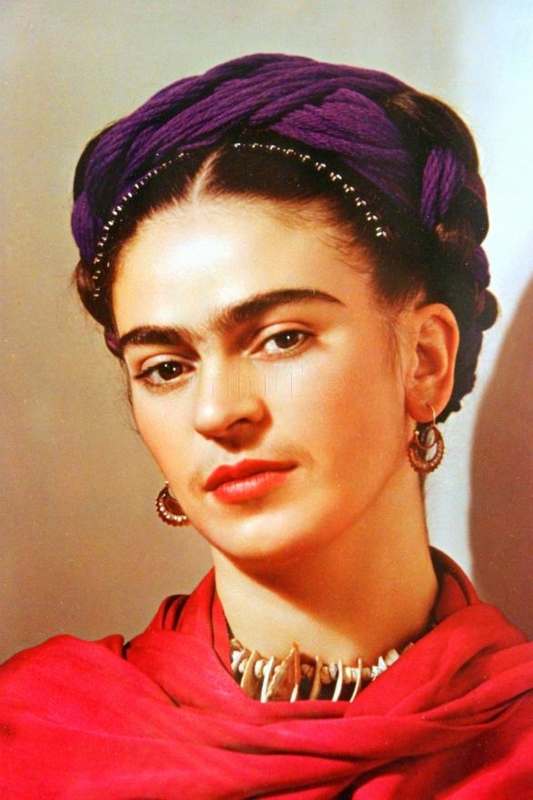 fur links to her amazing gull-shaped monobrow through the shared colour and her unflinchingly portrayed moustache. 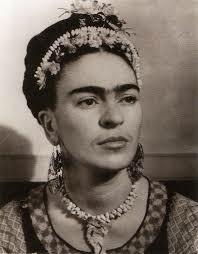 She has black eye-liner echoing those eyebrows. The lip hair reflects them. So some strong X-shaped geometry is the focus of her face. The background of wheat reminds me of Van Gogh. The yellow is related to his sunflowers. The tendrils at the top suggest growth and something of the jungle. The shapes also remind me of Rousseau’s vegetation. …on reflection, I don’t think it’s wheat. I think it’s some kind of exotic jungle plant. So we’re in a Latin-American jungle world albeit of a light and limited kind, no sense of enclosure by trees. After 20 minutes standing here what do I take away about this beautiful picture? 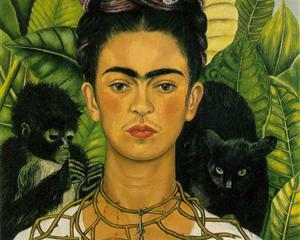 It’s more for Frida than for us – or at least she’s giving us only so much. The rest is hers. Here’s the last Picture of the Month – as you can see the series title has a touch of irony about it.